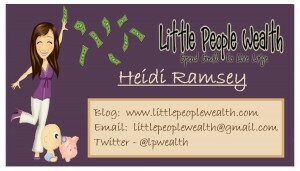 I had the (wonderful) opportunity to review custom designed business cards from Blog Print Media. First of all, Kelli was super fast! She had the work done within a day. I have been needing business card for a while now. If you are a blogger then there are a few things that you need and business cards and a media kit are two of those things. Both of these products are “first impression materials”, which means they can make or break a deal for you and your blog. You should send your media kit to all of your pitches and advertising inquiries. A well designed professional kit shows that you are serious about your business. I always use a quick sheet, which will also save you time since you can forward your quick sheet instead of answering every email individually. A business card can be used for many different things. Business cards are cheap to print (often times you can get free deals), but you do not want to use a free design. Free designs are obvious and they look cheap. The $25 you spend for a custom design is well worth the difference your first impression will make. You can use your business cards at conferences and other “official” blogging business spots, but you can also be creative with them. You can send them to card swaps (try swapping sites or MomPacks.com). The cards will be mixed in with free products and given to other mom’s. You can also post a card on public walls (with their permission of course). Libraries are usually the perfect spot for this. Be sure to check with your librarian, but they do generally have an area where local people can post advertisements. You can also team up with a local sales consultant (Avon, Mary Kay, Discovery Toys, Pampered Chef, etc) and ask that they distribute your card with their materials. You can work out some sort of deal that is beneficial for both of you (like offering them advertising on your site in exchange for them distributing the cards). Never underestimate the power of advertising! A custom designed card is $25 and after that you can get 250 cards for the price of shipping (using VistaPrint) for as long as you like. That is a lot of potential blog readers! Kelli offers business or mommy card design for $25, a media quick sheet design for $60, and a full media kit (including the cards and quick sheet) for $450. I cannot say enough great things about her work! She is the official designer for MomBoost. You can purchase a package from her by filling out the form here. You can also follow her on twitter or on facebook. I love the idea of a quick sheet to email to contacts and pitches. I would love to hear more about how you deal with PR requests and all those emails that come in. It’s hard to manage! I have a few different files and I file the emails as they come in. After I file everything I start my responses and I send my quick sheet along with a sentence or two to all the PR requests. It really saves time! Thanks for the tips. I have been debating about getting business cards but I like what you had to say about them. Thanks for sharing!